The Modi government has invested hugely in its mission to clean the Ganga, inviting companies and countries to offer their technological expertise. But is it really needed? EVER SINCE he came to power at the Centre a year ago, Prime Minister Narendra Modi, who has been elected from Varanasi, has added his own bit of charisma to save India’s holiest river. From attending high profile “Ganga Aartis” to reiterating promises to clean the river, Modi has invested his and his government’s prestige in the Ganga project. It all culminated in April this year, when 200 experts from various countries gathered at the India Habitat Centre in New Delhi. They were mostly technology and infrastructure providers, who had been invited by the Union Ministry of Water Resources, River Development and Ganga Rejuvenation to share their technologies to clean the Ganga. The experts came from Singapore, the Netherlands, Australia, Canada, China, Germany and the UK to name a few. There were also representatives from India. The experts have offered a number of technologies to clean the river, but experts, mostly from India, say it is counter-productive since many of the technologies already exist in the country. The amount of funds allocated to the cleanup of the Ganga are huge. In the 2014-2015 Budget, the government has allocated Rs 4,173 crore for water resources and NamamiGange, an integrated Ganga conservation mission. In the interim budget, the government had set aside Rs 2,037 crore and Rs 100 crore for ghat development. Little wonder then that the avenues for companies offering their expertise in cleaning the river are huge. Different companies have offered different technologies to clean the Ganga. For instance, Ecosoft from Singapore is experienced in using technologies on the principle of aerobic and anaerobic processes or using microorganisms for cleaning wastewater. On the other hand, Jinmin Water Co Ltd China uses sequencing batch reactors, activated sludge process and a few modified versions for cleaning wastewater. Officials from the Netherlands-based firm, Qua-vac, who attended the conference, shared their Dubai experience about sucking the sewage by vacuum and bringing it to sewage treatment plants. Sewage collection would be easier this way and instead of a conventional 150 millimetre (mm) pipe used for it, a 75 mm pipe could be used instead. The pipe has to be laid only 30 centimetre (cm) below the ground – this would reduce the cost of supplementation of the sewer system, said Devender Dhapola, Technical Head, National Mission for Clean Ganga (NMCG) under the water resources ministry. However, these companies may not be suggesting anything new. “Ecosoft’s technology has been designed already by many technology providers in India. If technologies are already available, why we are approaching international companies,” argues B D Tripathy, Coordinator, Centre for Environmental Science and Technology, Banaras Hindu University. Similarly, in the case of Jinmin, ArunaSinha, scientist, Central Pollution Control Board (CPCB), confirms that Sewage Treatment Plants (STPs) in India are already using the technologies that the company is offering. As for Qua-vac’s technology, where a 75 mm pipe can be used for sewage collection, and can be laid only 30 cm below the ground, it also means that to bring sewage from the parts of the cities without sewers laying of pipes becomes necessary, says Sanjay Aggarwal, chief executive officer of Clover Organic Private Limited. Aggarwal had also approached NMCG to offer his bioremediation technology. The Ganga is polluted mainly because of the uncontrolled domestic sewage. The problem is that the focus on building more and more wastewater treatment plants has taken away the attention from cleaning the river, says an analysis by New Delhi-based non-profit Centre for Science and Environment (CSE). This analysis also shows that sewage generation is underestimated and only building new STPs will not solve the problem as most of the cities lack sewer connectivity. India already has experience of privatising water and wastewater plants. One example is of the Rithala wastewater plant in Delhi, which was built by Ondeo Degremont, a French company in 2003, and is now responsible for managing it jointly with the Delhi Jal Board. Dhapola said the foreign companies who have offered their expertise on the Ganga will be working either on design-build-operate-and-transfer basis or public-private-partnership basis or special purpose vehicle basis. The state will choose the technology or infrastructure provider through a bidding process. The Centre will continue to bear the full cost of operation and maintenance (O&M) of the sewage treatment plants for the first five years and after this, the plant will be handed over to the state government. The state may give the O&M to local bodies. When the O&M of STPs will be transferred to the urban local bodies, how well these plants will work remains unclear mainly because of the poor financial state of local bodies in all states along the Ganga, says CSE’s analysis. However, what is needed most is political will. 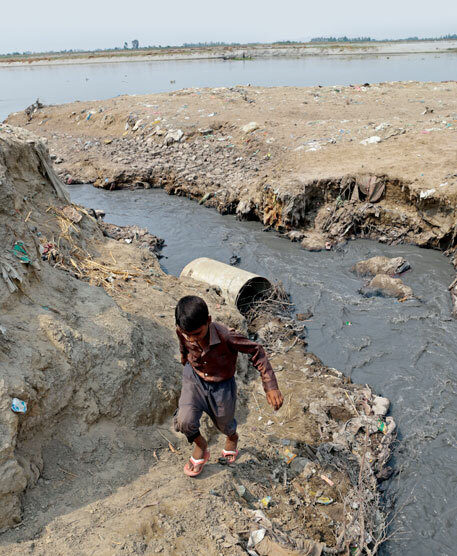 A K Gosain from the Indian Institute of Technology, New Delhi, says, “There is no dearth of technologies available in India but these technology-specific plans never helped the Ganga.” It needs water. The state local bodies have always been criticised for not improving urban infrastructure. I am disappointed by this article. I was expecting an analysis, a solution. Neither is present. If Ganga needs water: how much, and from where it will come. The key question is not whether technology is available in India or not; in any case the technology does not cost money, the equipment does. Thank you for the valuable comments. This time we were trying to bring in an idea that there was no dearth of technologies available in India but past experiences showed that only technologies cannot clean the river. The article specifies the technologies proposed by different countries and what already exist in India. However, I was thinking about the ways in which people who are directly related to the river either through their hometowns or as tourists can help in cleaning the river. How can an individual be convinced not to throw his faecal/domestic/religious waste in the river in a long lasting manner? The article is another timely reminder of the status of Save Ganga mission. If heaven and earth can be moved to build a Delhi metro that merely caters to the transport needs of urban Dehites, then I think the U.P. Govt. can certainly muster the will, authority and creativity to rehabilitate the openly and most shamelessly polluting textile and leather industries along the Ganga in a win-win manner. Just like that apparently innocent but most sensible child of the "The Emperor's new clothes" story, every aam aadmi knows what needs to be done to save Ganga - ruthless obliteration of plastic & aluminium packaging materials from the ghats and the regions along it and replacing them with cloth bags(any enterprising donor or ideally the polluters themselves by way of expiation, can come forward to make a "daan" of free cloth bags to all the shopkeepers), substituting plastic tumblers in restaurants, eateries etc. used for serving water, coffee, tea etc. with areca leaf tumblers(these are sturdy and can withstand hot and cold temp. for 3-4 hours without leaking or imparting odour), building of bio-toilets etc. Short of taking these basic measures, no amount of intellectual exercises like seminars, inviting this scholar and that scientist, roping in advanced technology solution providers is going to help and will prove to be useless! It is as simple as that. It is perilously high time we decided - whether we want our Mother River Goddess alive OR raped in the name of providing employment to few unscrupulous polluters? A river's life is in its natural flow. 1) Where are the waters coming from- how safe are the sources from damming/obstruction/ecological destruction. 2) What do they gather/what is dumped into them on the way to to sea? -unless these two questions are answered in depth, we will never know the truth. And the money will come, and go. May be River Ganga has its own inbuilt capacity to keep it clean being flown through hilly areas which have herbs otherwise why people bathe in it while dead bodies pass by near. THE FIRST AND FOREMOST TASK SHOULD BE TO STOP FURTHER POLLUTING GANGA RIVER BY STOPPING INFLUX OF SEWERAGE AND OTHER POLUUTING MATERIAL INTO GANGA, AND PROTECTING RIVER BANKS BY GROWING GRASS AND PLANTING TREES. Cleaning of the ganga river comprises of (a)controlling point source of pollution and (b)increase flow of fresh water. It appears that the discussion was only centered on treatment of sewerage and other point source pollutants. But ganga river is not a closed water system. It is the main channel of the huge ganga river basin containing many tributaries which are also discharging polluted water to ganga. Rather controlling of major point sources of pollution along the tributaries in the upper reaches of the basin should get precedence or to be done simultaneously. It is well documented that ever decreasing level of ground water of the basin due to continuous withdrawal for irrigation and other purposes led to inadequate flow of fresh water to act as dilutant. Perhaps basin wide water harvesting along with soil conservation movement with the community level participation should be started right now to increase ground water level. For this purpose green brigades should be constituted at village level and trained in traditional methods and knowledge of water harvesting and soil conservation reinforced by modern technology where ever needed.